Get Hollywood Suit For The Style Of A Star! Home :: MensUSA Articles :: Get Hollywood Suit For The Style Of A Star! Formal wear, formal clothing or men's suits is a general fashion term used to describe a men's wear that worn in formal occasions, like wedding, social gatherings, in business and corporate clothing. Men of high strata are particularly dressed in heavy tail coats as an evening wear. As a time goes until in this time of modern world a bulky and uncomfortable formal clothing and garment were replaced by more comfortable garments with stylish cuts. People have always been inspired by Hollywood suit styles and try to include that in their fashion sense. This is why we at MensUSA have a special range inspired by Hollywood stars to meet the demands of our customers. A men's suit is incomplete without formal suits, this suits consists of a coat or a dinner jackets, a waistcoats but this optional, a pair of a trousers, a formal shirts, and tie. The history of this kind of apparel which can traced to the nineteenth century America, which created the innovative dress for men as an alternative to the long and heavy frock coats that were popularly worn as a business dress. With the coming of the lighter business suit, men gave up wearing the old styled heavy suits and these Hollywood suit gained popularity and gradually replaced the old style. 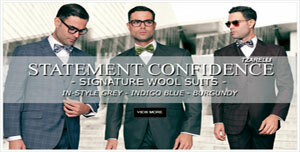 Men's suits are available in different style. This includes the Double Breasted men's suits, this suits has two parallel rows of buttons and is what they call a conservative style. But as what the other fashion expert says this style is not in fashion these days. Single-breasted Hollywood suit, these men's suits have two, three or sometimes four buttons. The men's suit that moderately tapered sides and have minimal padding on the shoulders with two vents is what they call British suits. The Italian suits are the most stylish and have padded shoulders tapered sides and do not have vent. The men's suits that have moderately padded shoulders, minimal tapering on them, are what we call a Hollywood suit, a more casual compared to other styles. One of the most important parts of men's suits is a formal shirt. MensUSA makes sure that shirts are made from a high quality of fibers to ensure, comfort, a good fit and durability. Some of the fabric that is widely used is oxford, this fabric are heavy and has elevated woven pattern. Shirts made from this fabric can be worn on both formal and casual occasions. This is another type of fabric is a Pinpoint oxford, a fabric that is light and smooth in feel, this is lighter that oxford. Poplin fabric is light as pinpoint fabric. It is available in smooth finish and is plain. This is also used for making customized formal or dress shirts. Pure cotton shirts tend to crumple easily and give an "already worn" look. Blended cotton shirts are wrinkle and stain resistant and are much in demand as the Hollywood suit.